Famous Hollywood Director-Ben Giroux Appreciated His Work & Armaan Malik His Mentor Prays For His Success ! Meet Parth Shrimali-Singer and Armaanian ! Meet Parth Shrimali , 18 year old aspiring singer and son of Govt. representative of Gujarat , Shri Maulik Shrimali. Parth is an undergraduate student and is currently aiming to pursue MBBS. 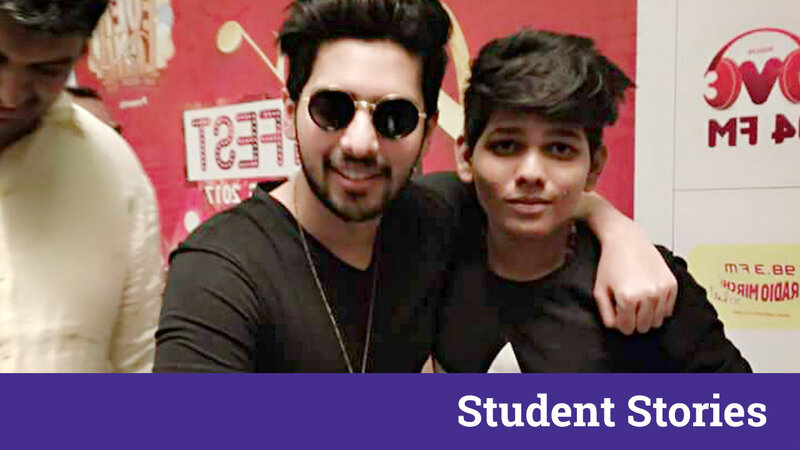 This Crazy Armaanian is in touch with his idol Armaan Malik and is preparing to perform with him one day. He wants to sing and perform besides Armaan Malik one day and is working really hard for this. Also, he lays strong foundation on learning new skills everyday, so that he can polish his own talent and rise to the top. Lets know more about him in detail. 1. As an aspiring singer tell me something about yourself . My life is only about Music. I just want to do music. My idol Armaan malik is my everything, He has taught me many things till now which are all valuable lessons and I want to learn from him whatever I can learn. 2. When did you discover a singer in you? I was 4 years old when I started singing. Since then I was very much eager to learn and train myself for the BIG STAGE. Since, then I have been passionate about singing and I want to make my career in this. 3. What are your achievements? Where do you see yourself five years down the line? My Biggest achievement of all, I am blessed to have Armaan Malik with me. Armaan malik replied me 13 times. I was awarded by Best performer award at Max New York life insurance company. And recently I got selected in the singing audition of KJ motion pictures. Also, Ben Giroux sir has appreciated my work and commented on my post. This was a great achievement for me. I see myself completing my MBBS and as a trained and successful singer in half a decade. 4. Ben Giroux, a renowned American director recently commented on your post. How did you feel about it? I was just shocked and mocked when he commented on my post. It’s like a dream come true when some great personality like him appreciates your work. Also Read The RISE Of Amol Mann ! The Powerhouse of Talent From Punjab Who Won Millions Of Hearts With His Debut Song- ‘Haan Teri’ With T-Series! 5. What are your upcoming projects? My upcoming projects are: I will do an album with THE TIMES of India in a month and will go further singing competition for KJ Motion pictures. 6. Parth tell us the most inspiring thing in your singing career. What music actually means to you? I just wanted to do singing because it is the only thing that makes me happy. And in future too I want to do singing. Music brings me a different level of peace and relief to me. I believe in doing deeds that makes me feel lively and happy, so does the music for me. 7. Do you believe in shortcuts? What is your key to success? No I don’t believe in shortcuts. In every field, struggle is needed and is essential. Sometimes I work on music till late night. So,definitely hard work is the key for the door of success. Also, always believe in yourself and never give up when times become difficult and always look at the brighter side of life. Scrumptious & Great Variety of Food With The Beautiful Foodie! Meet Manmeet Kaur- The Expert Food & Beauty Blogger Who Will Guide You To Food Paradise !